Demand for education and the exponential growth of interested owners of Residential Assisted Living Homes for the Elderly, the Residential Assisted Living Academy has announced expanded class sizes to accommodate the sharp rising interest. “We had waiting lists for every class, and people were offering to stand just so they could be in the room." Gene Guarino, Founder and CEO of Residential Assisted Living Academy. Residential Assisted Living Academy (RALA) has announced the expansion of all certification classes for 2018 due to sharp rising interest and heavy demand for education shown by the exponential growth of interested owners of Residential Assisted Living Homes for the Elderly. 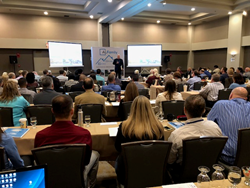 In the last year, RALA had been experiencing packed classes for their live 3-day certification course held in Phoenix, AZ and a 250% growth in attendance. RALA took the hint and expanded the size of their classes for all of 2018. For the first time in almost a year, they could fit everyone in the new room without having a waiting list. With the ability to serve over 130 people in each live training they are still able to offer the bus tour of the homes but have reduced the number of times they offer the course per year. “Now we have eight big classes a year which allows us to serve more people while still keeping the bus tour which is an integral part of training future owners,” Gene explained. “We are dedicated to helping the rising need for good, responsible, caring residential assisted living home owners that want to help others while also creating a highly profitable business for themselves and their families,” Guarino said. With only 7 more classes available this year, the March class is almost full, although there are seats still available for several of the classes later in the year. “People use to think we were just saying that we have waiting lists and then they saw that we weren’t kidding. The truth is in the past we couldn’t fit any more people in there because it was fire hazard,” said Isabelle Guarino, COO of Residential Assisted Living Academy. For more information on the months and dates of the seven remaining live trainings in 2018, go to http://www.RALAcademy.com or call 480.704.3065 to reserve your seat.